Okay, let’s cover the basics. This is a webpage. At the bottom of the image there are the familiar list of blue links that lead to other webpages. Below those links are more links, and finally navigation at the bottom of the page to go to the next page of search results. Unsurprisingly, there are over 5 billion “hits” for the query – so there are a lot of pages. But the search engine organizes these in order of relevancy – that’s what makes a search engine like Google so useful, of course. But Google evidently does not think that links sorted by relevancy is useful enough – so they went a step further. They introduced “cards.” These are relatively new features of Google searches (and they can also be found in a lot Google products with “material design”, such as Google Now.) They are discrete, framed, drop-shadowed rectangles that tries to distill the most useful information related to a search. 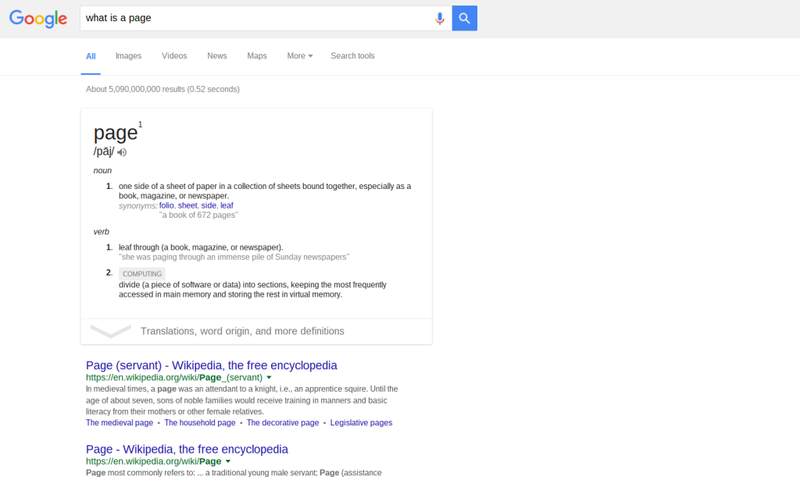 In the example above, Google provides the definition of what a page is in a card. David, looking back over this something struck me – the visual similarity of Google’s top hit ‘card’ with a traditional library card catalogue card. With its large title at the top and then descriptive information following, as well as implied links (in the online case hyperlinks) to the most relevant/useful information. Although here the work – if we can call it that? – is being done by a computer, instead of a reference librarian. I won’t get into the relative values of either or, although I think this is an interesting choice, and maybe a deliberate one?